This is no surprise. Hass, reared in an orthodox communist home, had long ago crossed the lines not only in abstract terms. She resides in Ramallah, having previously made her home in Gaza (but that became uncomfortable and unsafe, given the illiberal nature of Gaza’s Hamas warlords). For the most part, the usual hodgepodge of Israel-bashers overseas avidly amplifies Hass’s every word. Her diatribes, however, barely resonate inside Israel except among small cliques of local ultra-radicals. But her stirring defense of rock-hurlers did succeed in setting off an uncommon hullabaloo. For one thing, her piece appeared the day after Waal al-Arjeh, the stone-thrower who hit Asher Palmer’s car in 2011, was convicted of murdering the young father and his one-year-old son, Yonathan. The judges determined that, contrary to forgiving attitudes by predisposed news-slanters, rocks can be lethal weapons. Palmer lost control of his car and was killed in the resultant crash as was the baby – a mere 17 days past his first birthday. But Hass is a seasoned political warrior and in all likelihood impervious to any pain that doesn’t serve the causes she propagandizes. In her universe, the fault for the tragedies of tiny Yonathan and Adelle – and too many others – rests with their parents and official Israel. The tots just shouldn’t have been where they were, Hass would surely aver. Nor is she likely to be swayed by the fact that the Yesha (Judea and Samaria) Council had demanded that Hass be indicted for incitement. Quite the contrary. She is likely to posture as the Jeanne d’Arc of free speech, despite the fact that Israel’s Left clamors for the prosecution of any oddball who dares opine in the other extreme. Its persistent drive to try Rabbi Yitzhak Shapira for his obscure 2009 Torat Hamelech, a scholarly treatise on the religious rules of warfare, is a prime case in point. Moreover, Hass didn’t merely extol stone-throwing but took the Palestinian Authority to task for not making practical anti-Israel attrition tactics part of the formal school curriculum. She recommends that “various forms of steadfastness and resisting the foreign regime, as well as its rules and limitations, should be taught and developed.” Thereby, Hass figures, Palestinian youths could be discouraged from aiming at Jewish children – not that anyone has yet come up with a reliable method to rapidly ascertain the age groups among a given moving vehicle’s passengers. But no such fine points bother Hass or her backers in the increasingly anti-Zionist Ha’aretz. That’s where Hass particularly resembles the Luxemburg prototype. To inveterate ideologues like Rosa, Zionism was anathema. Although reviled by Germans as a contemptible generic Jew (with her revolutionary doctrines falsely ascribed to all Jews), Rosa’s antipathy to Jewish causes was a near-boastful expression of alienation from her own Jewish roots. Rosa’s indifference to her own people arose from the intuition that cutting the cords of disagreeable Jewish affiliations eases acceptance beyond the ghetto. This was Rosa’s ticket to citizen-of-the-world credentials – even if only within the setting of her Marxist milieu, packed paradoxically with her own breed of estranged Jews. No less paradoxically, her professed lack of solidarity with fellow Jews flourishes remarkably in the Jewish homeland – the creation of the very Zionist movement to which Rosa was the antithesis. Logically, this country ought to be the last place in which to expect Jewish self-loathing. After all, Zionism regarded itself as the remedy to Rosa-syndrome complexes. But the Zionist cure is perhaps of limited effectiveness against the collective mental aberrations which 2000 years of exile, helplessness and dependence on the whims of diverse potentates and tyrants inculcated in downtrodden Jews. Rosa’s keenness to bask in the warmth of socialist comradeship still abounds among all-too-many Israelis. For them too, distancing themselves from the inherent interests of the Jewish people purchases a voucher for universalist endorsement. This mindset long predated actual Jewish self-determination. As in the Hass episode, in its more extreme manifestations this inclination didn’t merely involve apathy toward the tribulations of fellow Jews but also meant active collaboration with the enemies of the Jews. This was already so before the pretext of “resisting occupation” at all came to be. Even Jewish independence hadn’t yet been declared, couldn’t be seized upon as a casus belli and misrepresented as the Palestinian nakba (catastrophe – the loaded Arabic moniker for Israel’s sovereignty). Husseini subsequently, in the role of pan-Arab prime minister, spent the war years in Berlin, where he consorted with Hitler, Himmler, Eichmann, et al. He broadcast virulent Nazi propaganda, recruited Muslims to the SS and actively foiled the rescue of any Jews, even children, during the Holocaust. Indeed as Arab terror escalated, proof mounted of active PKP collusion with it (in incidents such as the 1936 bombing of Haifa’s Beit Hapoalim and Tel Aviv’s Fair Grounds). When Arab leaders themselves announced a brief truce in the autumn of 1936, the PKP rejected any ceasefire on the grounds that “Zionism drags Jews to hell… Zionists and imperialists alone are to blame for these days of atrocity” – much like settlers are nowadays held liable. The anti-Zionism of the PKP evolved gradually. The party arose from the fringes of the broad-based Poalei Zion. 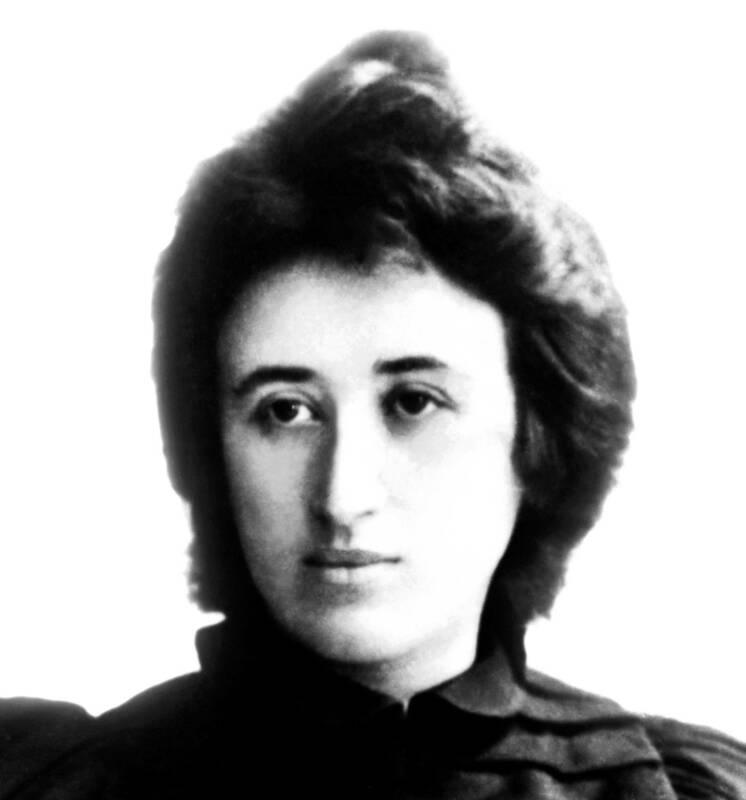 In 1919 – coincidentally the year in which Rosa was fatally bludgeoned – the embryo faction banded as the Hebrew Socialist Workers Party. But by 1922 its rejection of Zionism became so all-encompassing that it ditched Hebrew – whose revival was core to the Zionist ethos – and reverted to Yiddish (the language which Moscow’s commissars preferred for Jews). In 1923 the PKP castigated Zionism as “a bourgeois movement serving the interests of British imperialism” (just as the Zionist state today is castigated for purportedly serving the interests of alleged American imperialism). The party cheered the 1939 Molotov-Ribbentrop pact that facilitated WWII. The PKP vehemently opposed fighting the Third Reich until Hitler betrayed Stalin and attacked the USSR in 1941. History is an irreverent matchmaker with a quirky sense of irony. Back in pre-state days, when the PKP assumed it was abetting Marxist goals, it also inter alia furthered the fascist game plan. It’s not much different today. The anti-Israel and pro-Arab line that Hass promotes appeals equally to anti-Israel forces on the international arena’s left and to rightist neo-Nazi outfits abroad. The rhetoric to which both supposed opposites resort when demonizing Israel is eerily similar. Hass delights them both. She may pose as the embodiment of humane admonition and hector as the self-appointed voice of Israeli conscience. She may adopt the affectation of doing the moral thing in our name but the end result is immoral and indisputably at our expense. Hass and her like-minded cronies in our midst aren’t held accountable and most probably never will. They are sure to continue deriding the Israeli mainstream’s disapproval of them. They will keep on deriving clout and celebrity in distant salons, campuses and media. They’ll keep on molding foreign opinion against their own people. Like Rosa, her heirs too have no room in their hearts for Jewish suffering. Rosa’s ghost walks among them and they bow to its diktats. ANY stone thrower should be considered a TERRORIST and should be shot on the spot ! Chris; You cannot forget ‘Sui Genaris’. There is a seperate set of rule that apply’s to Israel’s response to violence than would apply to any other nation. What a sad and SICKENING account dear Sarah ! You are quite correct that JewHate, which is generally a behavioral disturbance of the gentile, also affects quite a few self-loathing Jews. It happens that I published a 9-page article recently in an on-line magazine which encapsulated the research done over the past 100 years or so of research teams of scientists from a number of universities and psychiatric and psychological institutions, all quite respected. They reached the conclusion that JewHate is a disorder, an aberration, a behavioral disturbance—-in short, a sickness. It has nothing to with what Jews ourselves do, don’t do, say, or don’t say and never has. It is not about us. It is about Jewhaters. The reason I did the article was to prove to myself that what I knew in my heart was true. There is nothing the matter with me, my family, my friends, my fellow Jews. Thus, it is at least comforting to know that we proud Jews, supporters of the Jewish State of Israel, are dealing not with reasonable, knowledgeable, logical folk who have come to the conclusions of JewHatred, but rather we are dealing with mental patients and emotional defectives. So we must treat these ill people as we would rabid dogs. We must protect and defend ourselves from them, as they are dangerous to us and harmful to themselves as well. While I’m not sure I agree, you might be interested in the book ‘Anti-Judaism” by David Nirenberg. W.W. Norton & Co. His premise is that Jew Hatred fills a need in the overlaying society. Hence the often rabid anti-Semitism in places where Jews are few or entirely absent. Of course Jew hatred has NOTHING to do with the Jews !!! Whenever I find out, that anyone has antisemitc prejudices, I am CONVINCED of that persons moral worthlessness…and I regard that person as an ENEMY ! This ls the legacy of the radical left, (communists). Those Jewish by birth almost universally denied their Jewishness. Haas is not, unfortunately, unique. They are traitors to both that faith and Israel. Maybe we’ll get lucky Sarah, and the silly Hass twit will herself be bludgeoned to death. Such sentiments are unworthy. We hold to a higher standard. All one need do is go all the way back to the roots of communism where Marx himself, in “The Jewish Question” openly called for the extinction of Jewish identity in total. Today brings news that our latest terrorist attack in the US was launched by two brothers from Chechnya. They were, of course, Muslims. They, like some of our other Muslim threats from Eastern Europe, were refugees. Their parents were granted asylum. Asylum from what? Why the oppressive policies of the Russian Federation against Chechnyan nationalists. We have been dodging threats from the fallout of collapse of that other communist paradise, the Federation of Yugoslavia. Those are Albanians and Croatians. The Albanians are Muslim (the Croatians are Catholics). The relationship between Islam and communism in Eastern Europe and Central Asia is very strange. I recall a scene in the movie “Reds”, about Richard Reed and his reports about revolution in Russia. In the scene a middle eastern man is preaching to a crowd and the scene suggests he is speaking out for the cause of communism. But when Reed gets a translation, the translator says he is calling for Jihad. Why is Hass and her admirers and imitators blind to the presence and influence of Islam in delegitimizing Israel and Zionism? On the other hand, Western influence gave birth to Al Qaeda in Afghanistan in an effort to undermine Soviet attempts to eradicate Islamic radicals there and establish a political foothold. We extol nationalism in places like Chechnya and Kosovo against the wholesome interests of Slavic countries. Why are we in the West blind to the dangers of Islam and the injustice of applying their interests against vulnerable societies in the East? If a few Jews get caught up in the confusion, it is no surprise. Thanks Sarah, very interesting article, very interesting history. Can’t Amira Hass be legally silenced in some way? Doesn’t Israel have laws against treason? You know–aiding and abetting Israel’s enemies? If not, what about income tax evasion? In the 1930’s, during the time of the aforementioned riots in Jerusalem and Hebron, there was a Detroit priest, Fr. Charles Coughlin, a virulent anti-semite, who had a radio show every Sunday morning. (I believe that Sarah has mentioned Coughlin in one or two articles) Franklin Roosevelt wanted to shut Coughlin down, but at first had no way to do it. Then FDR found that Coughlin was delinquent in paying his taxes, and the IRS shut down his show, and jailed him. Interesting article on the psychology of Jews who hate their own kind. Amira has “no room in her heart for Jewish suffering;” a lunatic. My lovely Rosa Luxemburg, and my lovely Amira Hass!! !